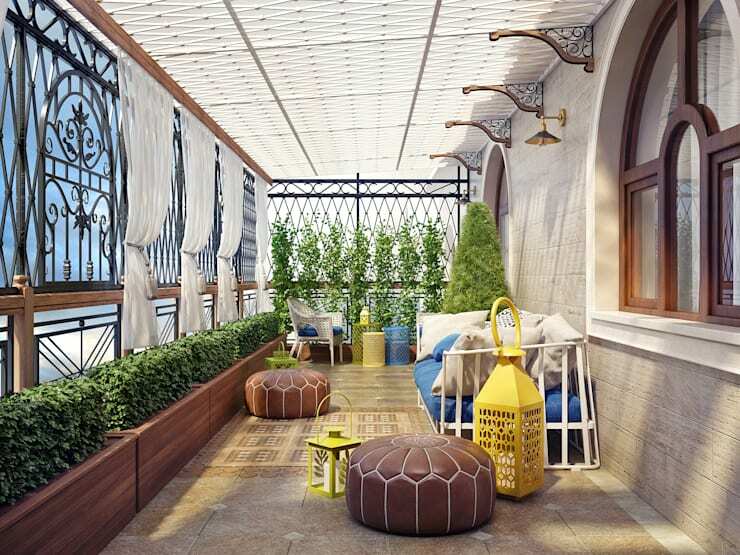 Of course all of us would just love to have a luxurious and spacious balcony that flaunts all the must-have elements like an exquisite dining table, a pizza oven and a bubble bath. But although you are free to decorate your balcony in your dreams to your heart’s content, real life is more restricted in terms of layout and budget. Which means you are probably dealing with a balcony space that is quite small and narrow, putting a severe damper on your outdoor-socialising ideas. 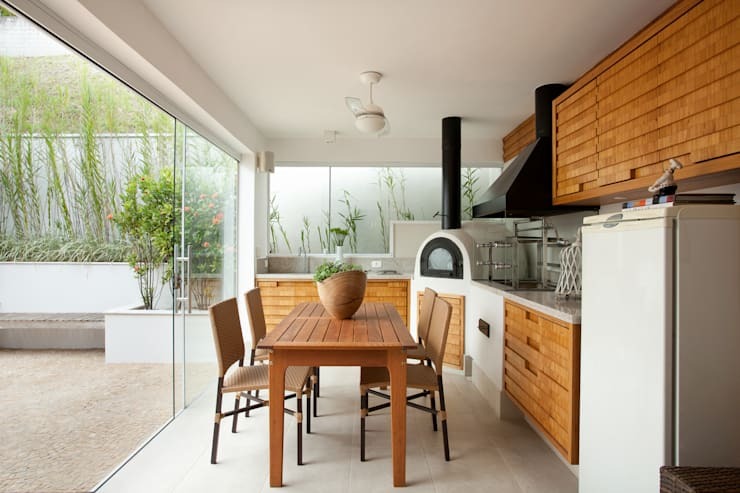 But no worries, as here on homify we can work with just about anything! 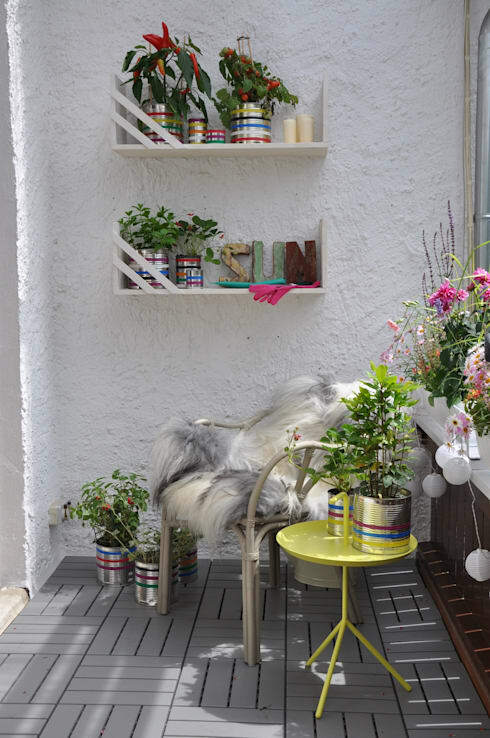 That is why we have gathered 9 pro-approved tips that can help you style up your little balcony into something truly fantastic. And although the end result might not be the spacious layout of your dreams, it can definitely be enough to ensure a most comfy (and stylish, of course) space to relax in. It might look difficult to work with a long and narrow balcony, especially when adding comfy furniture, but see this as a design challenge instead of a problem. 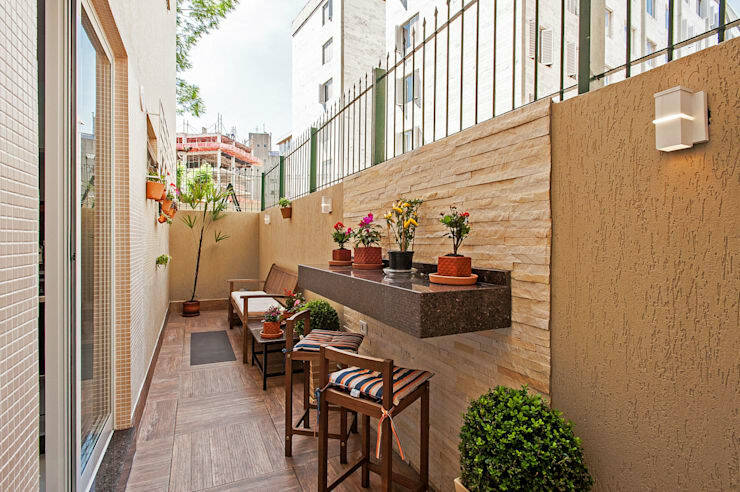 Take a few tips from this example, which sees this narrow balcony flaunting wall-mounted tables and having all the seating areas packed against one wall. Wall-mounted shelving is ideal, for they take up no floor space whatsoever. That leaves open more legroom for your chair of choice, or even a fluffy pouf or cushion. Allow our extensive list of professionals (including interior designers, architects, gardeners, lighting experts, etc.) to help you conjure up the house of your dreams. Opting for a new floor surface can drastically change how that balcony looks (and makes you feel). We recommend patterned timber such as shown in our example above – they add both a homey charm and detailed motif! A comfy and stylish balcony doesn’t have to drown in décor and furniture pieces – opt for minimalism and simplicity by choosing a simple dining table and a braai (if you have the space, that is). Glass is a heaven-sent material, as it can separate different areas without visually closing them off. 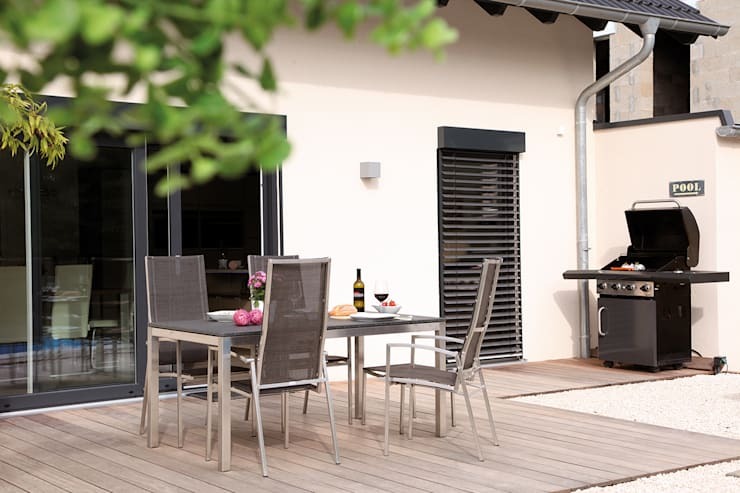 Opt for glass doors for your balcony to let your interiors open up to your outdoors. Not only do pretty potted plants enhance a balcony, they also purify the air and cool the space down – all this while looking stylish. Go with plenty of greens and inject a brightly coloured flower here and there for some eye-catching detail. It doesn’t get any more relaxing than a stylish hammock. 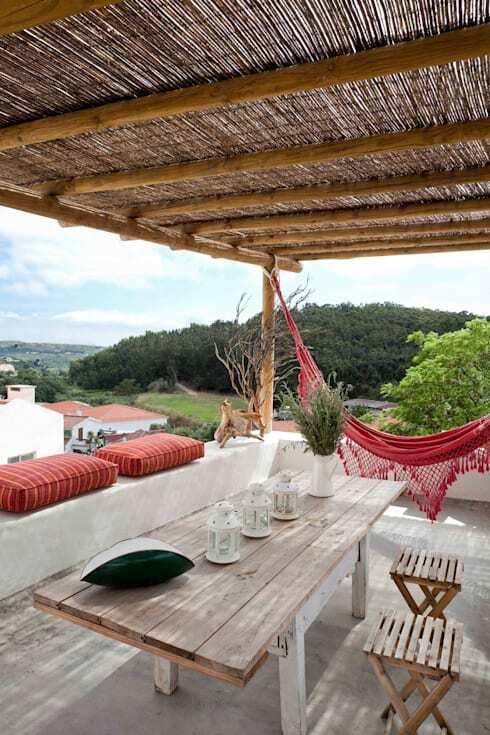 By opting for a brightly patterned and coloured one (hung in the shade, of course), it can make you feel as if you have travelled to some exotic location every time you step out onto your balcony. DIY projects are excellent for saving money and injecting your own personal touch into a space. 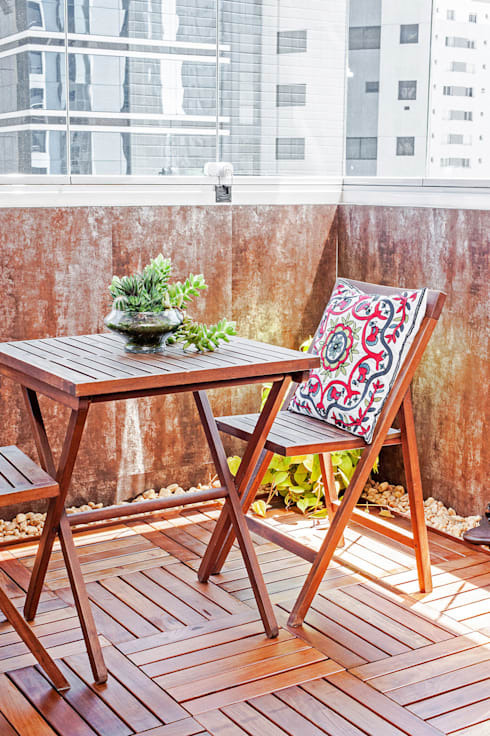 See how this outdoor setup makes use of timber crates which hold up a glass pane (ta-da: instant coffee table!) while pairing up beautifully with the hanging loveseat. Along with keeping the sun out, curtains also add some softness to your balcony space. And plush cushions on the floor ensure a cosy lounging spot for when you just want to chill and relax. So easy! 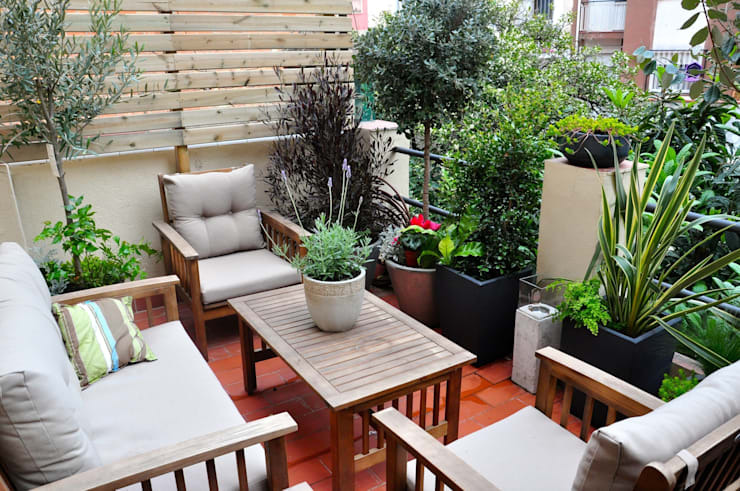 From the balcony to the garden, see these 22 easy ways to improve your small (but beautiful!) outdoor space. Got any more tips to spruce up a balcony? By all means, share with us!